Motor yacht Azzurra II is a 47,50m (155'10'') yacht built by CRN Ancona in 1988 and refitted in 2008, 2016 and 2019. She is a stylish, luxury crewed superyacht with accommodation for up to 12 charter guests in a master suite, 2 Queen Cabins and 2 Twin Cabins. Her design is by Gerhard Gilgenast, while her original interiors the work of Paola Smith. Three exterior decks include the main aft deck, which is shaded and ideal for gathering with friends while in port, this area is used in addition as a boat deck for the yacht's tenders while underway. On the foredeck is a comfortable seating and sunning space. Her upper aft deck has partial shade and alfresco dining. The sundeck is impressive, complete with a 6 person jacuzzi, sun pads, sitting areas, and a cocktail bar. On the stern of the yacht is an extended swim platform for easy water access. M/Y AZZURRA II features an inviting and elegant interior decor, using pale tones and bespoke finishes throughout. A generous main salon is open plan with the formal dining placed forward, it is surrounded by panoramic windows, bringing in plenty of natural light. The CRN Ancona yacht's sky lounge offers a casual solon, great for evening canapes prior to alfresco dining on the adjacent aft deck. On this level is the master stateroom, with king size bed, 21 perfectly placed windows, and private forward facing deck. The yacht's twin MAN engines provide speeds of 14 - 16.5 knots, she is fitted with zero speed stabilizers for increased comfort. 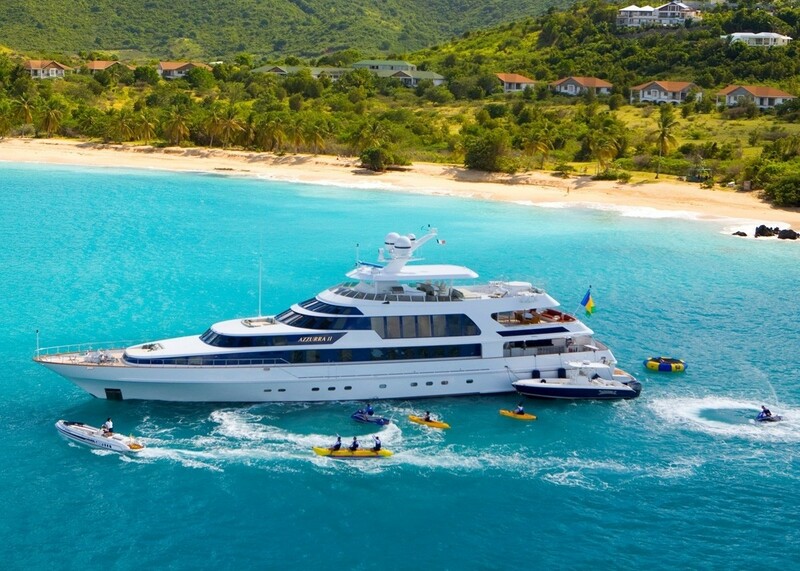 The luxury motor yacht AZZURRA II is able to accommodate up to 12 guests in 5 cabins. The Owner's suite is located on the upper deck and boasts a king size bed and panoramic views. The cabin has a private sunbathing area forward, an extra-large bathroom, with floor to ceiling windows and a rowing machine. The remaining guest accommodation is located on the lower deck and includes 2 large staterooms with queen beds and ensuite facilities and 2 large staterooms with twin beds and ensuite facilities. Tenders & Toys: ~32ft Boston Whaler with 2 x 300hp (towed) ~22ft Novurania RIB with 240hp ~2 x Yamaha Waverunners (VXS-100) ~1 x stand-up Yamaha Jetski (Superjet Race Performance) ~2 x Seabobs (F5S) 2 x Kayaks ~Waterskis ~Wakeboard ~Wakeskate ~Donuts ~Banana ~Trampoline ~Beach toys ~Fishing gear ~Snorkelling gear ~Jacuzzi Audio Visual Equipment and Deck Facilities: ~Flatscreen TVs and DVD players throughout ~Kaleidescape Movie/Music Server system (1,500 titles) with Crestron controls ~Sat TV Communications: ~Communication via Satellite & 4G: ~V-Sat (phone, fax, data) ~Fleet 55 (phone, fax, data) ~Mini M (phone and fax) ~WiFi Internet Access throughout ~GSM phones ~Gym equipment: ~Exercise bike & rowing machine in owner's bathroom.